Responsive Special Products Carousel Module for Prestashop with Google Rich Snippets Created by Webtet. 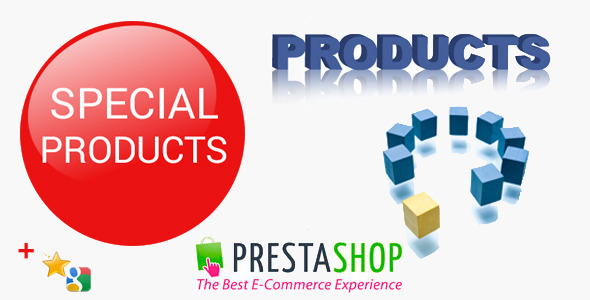 This templates have specific characteristics, namely: Responsive has features such as High Resolution: No, Compatible Browsers: IE9, IE10, IE11, Firefox, Safari, Opera, Chrome, Software Version: PrestaShop 1.6.0.x, PrestaShop 1.5.6, PrestaShop 1.5.5, PrestaShop 1.5.4, PrestaShop 1.5.3, PrestaShop 1.5.2, PrestaShop 1.5.1, PrestaShop 1.5.0 . You can use this Responsive Special Products Carousel Module for Prestashop with Google Rich Snippets on Plugins category for best responsive slider, best slideshow, best slideshow plugin, Carousel for Prestashop, carousel special products, ecommerce, google rich snippets, responsive carousel, responsive carousel slider, responsive slider, responsive slideshow, special products, touch carousel and another uses. This module lets you add beautiful responsive and touch enabled (you can just swipe to scroll through the products) carousel with Special Products. Our premium quality carousel easy to use, fully configurable and adaptable to any mobile device.This is premium carousel for your store. This module will help you change your store, make it more professional and engaging. Also, with this module you give users a better customer experience. It will increase your sales. Super easy to install. You can select design and style all elements of this carousel. Different positions of hook this module on Home, Left or Right Column. Setting for display products number in five different screen resolutions (desktop, tablet and mobile). Settings for animation carousel – slide, pagination, rewind and stop hover, auto play. Selecting to display or not, different elements of carousel like – label “new”, old price, quick view and many others. And one more advantage of this module it SEO ready with Google Rich SnippetsSchema.org). Let’s convert your visitors to happy customers !!! Left or Right Column(Also you can change color in admin panel). Animation speed carousel – slide, pagination, rewind and stop hover, auto play. Settings Display element “Special Carousel”. Design and Style element “Special Carousel”. SEO ready – Google Rich SnippetsSchema.org). Display – Home Page, Left or Right Column. Touch enabled option for product sliders. Animation speed carousel – slide, pagination, rewind. Desing amd Style element “Special carousel”. Update module add new configuration for this module.